Think you know your bike lanes from your bioswales? 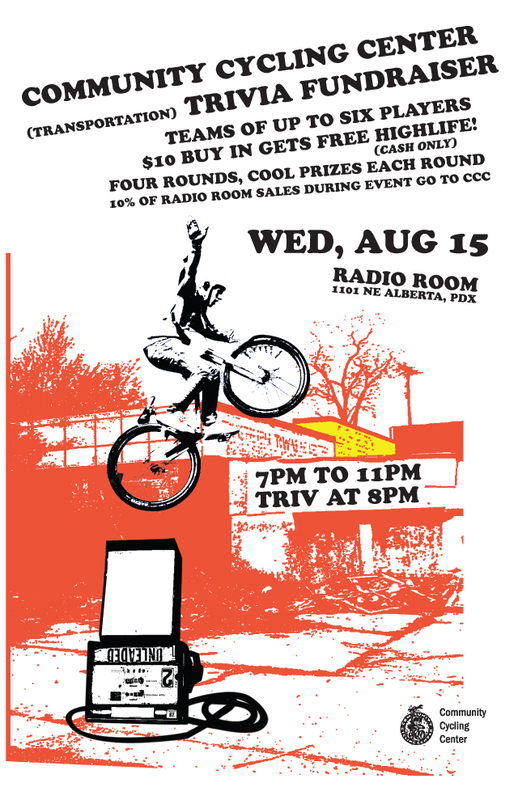 Join us on August 15th at Radio Room for a benefit trivia night and put your knowledge to the test. This special evening will be dedicated to all the transportation trivia (local, national, maybe even international!) that you can wrap your mind around. Teams can include up to six people, so bring your transportation nerd friends! $10 cash gets you a spot and a beer. All entry fees go directly to the Community Cycling Center. As a bonus, Radio Room will donate 10% of all sales from the evening, and they even designed an awesome poster. There will be prizes for each of the four rounds and we’ve already lined up some exciting items for winning teams, thanks to our pals at Salt and Straw, Bikeasaurus, North Street Bags and Good Sport Promotion. Mark your calendars and start studying!